The Gay Gamer: RE: Something old or something new? You know how I mentioned (in this post) that I'm wasting way too much time pondering how I'm going to spend the birthday/Christmas money I'm sure to receive from my parents in the next few months? I've been interested in Nintendo's first batch of Famicom games--released on those iconic "Pulse Line" cartridges that can be seen in WarioWare D.I.Y., for instance--ever since I laid eyes on this photo of Donkey Kong Jr., but the high price of many of these titles kept me from buying any of them. A few weeks ago, though, I came across a pair of auctions on eBay that included nine of these "Pulse Line" Famicom games, each of which came with their original boxes and manuals. Long story short, I ended up winning both auctions for a fraction of what I would have expected to pay for these particular titles. Anyway, although I'm now the proud owner of nine (of 14) "Pulse Line" games--Donkey Kong, Donkey Kong Jr., Donkey Kong 3, Gomokunarabe, Mah-Jong, Mario Bros., Pinball, Popeye and Tennis--I currently can't play any of them. Hence, my decision to pick up a Twin Famicom as soon as possible. In the meantime, check out my Flickr photostream if you're at all interested in seeing a few more photos of my recent acquisitions. How cool! It's sad that we don't get any of those sweet multicolored cartridges over here. Don't get me wrong, I love the gray NES carts, but...they're SO colorful! 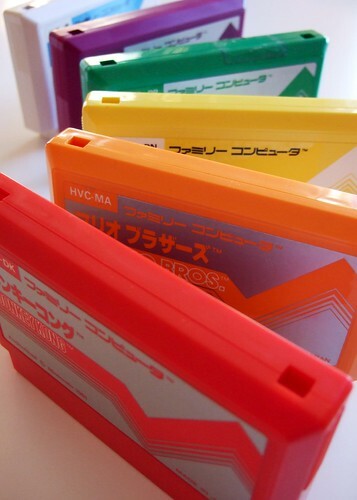 Yeah, I'm with you -- the gray NES carts are cool, too, but I just love how colorful the Japanese carts are. Plus, they're tiny -- maybe half the size of NES carts? Oh, and check out the boxes that each of these games came in -- even cuter! Also, I was paging through your flickr stream, and the spider photos? Eww. I'm going to have nightmares. You're a brave soul. And...lastly...I think it's really freaky that the card you made for your hubby has your nickname on it...and it's the SAME NICKNAME I used to have when I was young...HOW STRANGE! Yeah, these earliest Famicom carts came in a box that was nearly the same size as the cart -- no plastic 'holder' or anything. Oh, and they came w/ manuals and sometimes an insert, too. I think later releases came in slightly bigger boxes, though, with the carts cushioned by plastic. As for the card -- I didn't realize my nickname was on there! My husband and his sister have called me that since early on in our relationship. Too funny that people used to call you the same thing! OK, my turn to be massively jealous! Those are awesome! I have the pulse line carts but mine aren't boxed. Those boxes are just insanely cool! Excellent way to spend the Christmas money! I have to admit, the boxes were what made me buy them. Like I said in the post, the nine games were split up into two different auctions, and when I saw them I *had* to have them.